Songs that Crack my Heart right Open (in the Best possible Way). I’ve been feeling pretty alone lately. Not really lonely but alone. It probably has something to do with the fact that my partner has been away for a month and drinking tea and watching movies under the blanket just isn’t the same when it’s just me and the dog. I’ve never particularly enjoyed—or rather, appreciated—Autumn. I don’t know why, maybe because it’s somewhere between those hot Summer nights (yes, that was a Grease reference), and the cold, cozy, I’m-never-leaving-the-house kind of Winter. It’s just…in between. But a few days ago something changed in my perception of this season. I’m not really sure what happened but it happened while walking in the forest and finally noticing that thick red and yellow leaf carpet that has been covering everything for a while now. All of a sudden, Autumn didn’t seem like something average or something in-between. It looked beautiful. It looked like a start of something new and an end of something that has run its course, done it’s time and is ready to move on. And now I’m finding myself appreciating this in-between season, the letting go of the old, embracing the new and, for a while, being somewhere in between. I’ve finally found the good in the in-between. I guess it’s the same with people—if we look close enough, we’re never boring or stagnant. Maybe we’re just changing, transforming, evolving, breaking and growing and the best (or at least the new) is yet to come. Or so I like to believe. So with Autumn and the cold creeping in, my mood shifts from cheerful Summery to a more contemplative one which goes incredibly well with some good music and, as it might be obvious from the pre-text, too many thoughts. These songs below are the ones that I’ve had on repeat for a while now and, unlike the season, I don’t think they’ll be going anywhere anytime soon. They crack my open heart open on daily basis and I hope they do the same for you. One of my all time Winter favourites. You might as well listen to the whole album (For Emma, forever ago) because it’s equally amazing. Goes well with: Cozy blanket + tea + heartache. No words needed. Just press play and fall in love. Goes well with: Checking his web page to see where the next closest concert is only to realise it’s nowhere near. Damn. Goes well with: Pretending it’s still Summer and planning your next surf trip. This song was recorded in a cottage on the side of a mountain in Berry, Australia, without the use of any instruments outside of his body. 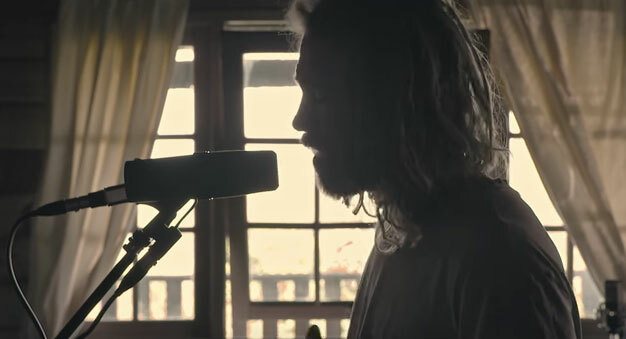 He later returned to the cabin and recreated the song live, in one take…and it’s a-mazing. Goes well with: Laying on the floor with your eyes closed and taking it all in. Everything this guy does is stuck-on-repeat worthy. Seriously. Goes well with: A glass of wine and dancing around you living room, pretending you know how to dance like those people in the video. Goes well with: Tears and smiles in Savasana. A Grounding Prayer for the Autumn Equinox. What they Don’t Tell You about Finding Yourself. Photo: Screenshot from a video. I loved them ALL – THANK YOU! This one just crushes me..